It’s really nice to have your own dedicated smoothie travel mug. It’s way better drinking out of a cold cup with straw than it is to be slurping your smoothie through a coffee tumblers lip. The thing is though there are tons of insulated mugs for smoothies for sale and it’s hard to know which ones are actually worth buying. BPA free is a given and that’s easy to check for but what if you want a mug that is really durable? What if you want a smoothie cup that doesn’t sweat? What if you want a tumbler that is dishwasher safe? Let me help you find the best to go cups for your smoothies. Just scroll down and follow me to the next section. If you’re taking a smoothie on the road with you, mixing one at the gym or the office, or if you’re just out running errands, it’s worth investing in a good container that won’t spill, won’t clog, and is easy to clean up. Spilling coffee typically isn’t that big of a deal so long as it’s not scalding hot or overloaded in sugar and cream, water is not a big deal at all either, it dries quickly but a smoothie spilling is a completely different story. They’re sticky and can leave behind odors of the powders or fruit and/or veggies in them and most smoothies can and will stain if you spill them. Smoothies also tend to be thick – even when they’re blended quite smooth – so using a traditional travel mug is not usually an option. Straw containers that don’t leak and don’t allow condensation are best and of these here are good options and no so good options. 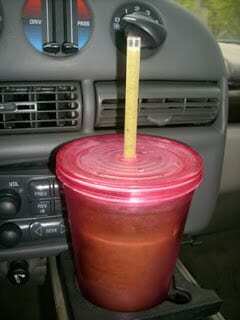 Below I’ve listed some of the best travel cups for smoothies. They are made to last, they don’t sweat, they have large straws for think smoothies, and they will fit in normal cup holders.. I hope you find this list useful. In addition to those referenced above I’ve provided notes on a selection of smoothie mugs in the next section down. Here are some more recommendations so you can easily follow a healthier lifestyle. The dual-purpose Container / Travel Cup is both a standard to-go cup for hot and cold beverages, and a blending container for use with Vitamix S-Series machines. Double-Walled container allows you to blend individual servings and quickly take them to go. Bormioli Rocco Fido Clear Jar, 67.75 Oz. The 25 oz. (.75 l) 100% BPA free Camelbak Better Bottle comes in eleven colors. The patented Flip, Bite-N-Sip Bite Valve makes for effortless one handed spill proof drinking. The Integrated looped handle design makes the Camelbak Better Bottle easy to carry or clip onto a carabiner. The Camelbak Better Bottle is the perfect size fitting into most cup holders and water filters. The Better Bottle is dishwasher safe, easy to clean and can withstand a wide range of temperatures. Ello Kella BPA-Free Glass Sipper with Straw, 20 oz. Characteristic Design: Bootlace Type fits in the hand and most bottle holders. Loop top, ergonomic flip cap, tapered spout, and the newest mixer ball whisk (BPA-Free). 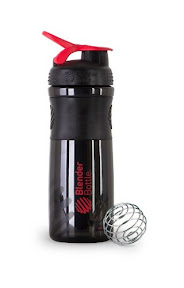 Perfect for sports: PP (Polypropylene) Mixer ball whisk moves freely inside the bottle as you shake, mixing even the thickest ingredients with ease. Enjoy your drinking and nutrition when you are in sports. The BOTTLED JOY Shaker bottle features a secure screw-on lid, a wide mouth for easy mixing, and markings easy measuring both ounces and milliliters. If you know of another good smoothie cup or shaker then let us know in the comments below and be sure to see this page for more top of the line travel mugs. This page also falls under my cold cups section of the store. Check that out for more insulated cold cup ideas. Here are two smoothie recipes you can try for your smoothie travel mug. Put all ingredients in a blender, puree until smooth. Serve, or fill your travel mug and take your delicious on the go. There’s no doubt that fruits and vegetables are important part of our diet. But, let’s admit. It’s easier said than done. With our busy lifestyle, we can’t begin to imagine how we could squeeze in our schedule the seemingly tedious task of peeling fruits and vegetables, juicing it, and drinking it. Not to mention, the “weird” taste. But you know, fruit and veggie smoothie should not be that boring and tedious. In fact, you could make it super easy, delicious and convenient. You can prepare it at home and bring it anywhere with the help of your trusted smoothie travel mugs. Yes, you can include fruits and veggies in your every day diet and you don’t need to fret so much about it.